I was minding my own business one day when my next door neighbour approached me about a privacy fence he was thinking about building across the bottom of his yard. He proposed continuing the fence along the bottom of my yard as well. At first I was hesitant, but once I saw the uncommon design he was considering, I was intrigued and agreed to join him in the venture. The posts were milled with dadoes to accept the fence boards. We used a router with a 5/8 inch straight bit (I recommend using a spiral bit for this sort of milling) with the final depth set at 1/2″ (Hind sight being 20/20, we should have gone a bit deeper to allow for more movement. After three years, I had to replace a number of boards that popped out of the dadoes because the posts had twisted slightly). We attached 1×2 runners to the bottom of the router to act as guides and we milled the dadoes slightly wider than the 5/8 inch required for the boards to allow for some movement. The dadoes were treated with end-cut preservative. The bottom three feet of each post was coated with creosote to help protect the posts once they were in the ground. We set the posts in 3 foot deep holes with crushed stone at the bottom to allow for drainage. The posts were anchored in place using concrete. We used 1×2 boards tacked to the posts and tacked to stakes to hold the posts in place until the concrete set up. 2×2′s or even 2×3′s would have made better temporary bracing. Concrete will shorten the life of the fence. Wood expands and contracts, cement does not. The wood fibers will become crushed and the posts will weaken and rot prematurely because of this. An article that appeared in an issue of Canadian Home Workshop Magazine (date unknown) suggested the following: For a longer life, the fence posts can be anchored in place using pea gravel, which will drain water away from the post, permit the wood to expand and contract without crushing it, and allow for easy replacement of posts that do become damaged. We used 2x4s for the bottom rails. The rails are positioned on the flat and were originally fastened to the posts using 3 inch screws toe-nailed from the sides and top. After 3 years, a couple of these rails needed replacing because of damage from the screws. Now the top and bottom rails are fastened to the posts using fence brackets for a stronger connection. The fence boards were cut the length of the distance between the posts plus a little more than the depth of one dado. We used 1 1/2 inch finishing nails nailed head first into the edge of each board (3 per board) to act as dowels to pin the boards together. The theory here was that warping would be minimized and any warping that would take place would be in the same direction. Using wood dowels or milling tongue and groove edges would have accomplished the same thing. But the nails were quick and easy and seem to have worked well. We double checked the measurements of the fence boards every third course or so and adjusted our cuts to compensate for posts being ever-so-slightly off-vertical. There is very little room for error with this design. All cuts were protected with end-cut preservative. The top rails were fastened in the same manner as the bottom rails by toe-nailing them to the posts using 3 inch deck screws. Three years later, fence brackets were installed for a better connection. My neighbor designed the simple decorative top board. To make the template, he used a hole saw to cut out the middle of a fence board board. He then cut the board in half (mainly to save on storage space). The curve was cut using a jigsaw. We used this template to trace the cutting lines on the board. It was positioned to line up with with the middle of the board. It was then flipped over and lined up with the other end. It would have been a bit easier if we cut the top board to size first, marked the middle and lined the template up with that. That would have saved trimming the same amount of each end of board to install it. All the boards were cut by hand using a jig saw. The result is that no two boards are exactly the same. If we were opting for perfection, we could have made a full size template out of quarter inch thick hardboard and used a flush trimming router bit. But when it comes to fences, rustic is good. The tops fit into the dadoes and are attached to the top rail using dowels and exterior wood glue. The moldings were milled at the router table from fence boards that had been ripped to width at the table saw. 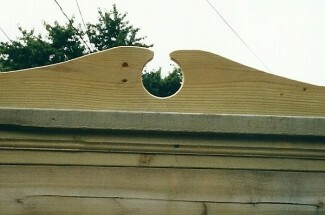 The moldings are fastened to the underside of the top rail using 1 1/2 inch deck screws in pre-drilled holes. No attempt was made to conceal the screws which are not very noticeable. The molding serves two purposes: it looks good, and it conceals the space between the fence board and the top rail. I used pre-assembled post caps consisting of a ball on a base plate. I drilled a pilot hole in the center of the bottom of the base plate and screwed in a dowel screw (threads at both ends, no head). I then drilled a pilot hole in the center of the top of the post and screwed the cap in place. Finding the center of the post and cap was simple: just use a straight edge to connect opposite corners. The center is where the lines intersect. 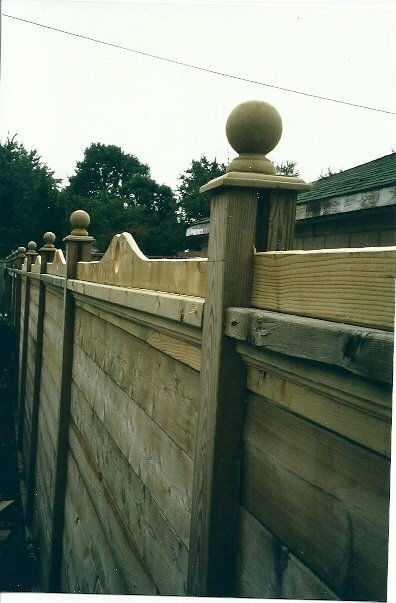 The end result of our labour is a fence that is a little bit different than the styles that most people tend to build. Wood fences, though more stylish than their chain link cousins, carry a hefty price tag. Not only is the initial cost more, but they do require periodic maintenance (water sealer) and will likely need the occasional repair. We used pressure treated wood. Cedar would have been considerably more costly. Wood fences also take longer to construct than chain link since they require more prep work (treating cuts with preservative, etc). Simply put, a wood fence is a lot of work. The design of our fence allows for some seasonal expansion and contraction. And we made sure we treated all the cut surfaces with preservative. Unfortunately, we did set the posts in concrete, so the fence will likely not last as long as it could have. Wood fences also require maintenance. They should be treated with a penetrating sealer when they are built and retreated every year or two. I sealed my fence after three years. 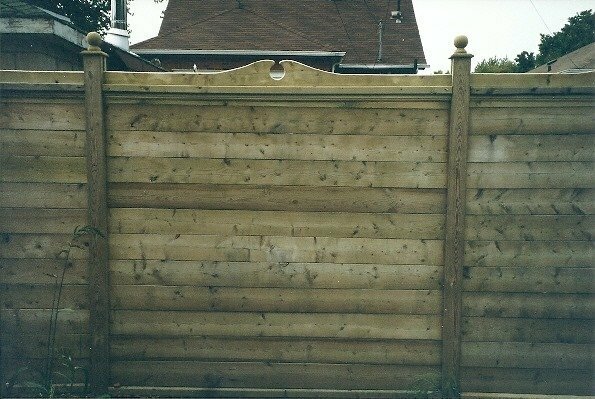 One final note: this is a solid panel fence and as such it does not allow much air flow. Depending on the size of the yard, I wouldn’t recommend it for more than one side, or else the yard will not get much of a breeze. Project was completed in the summer of 1999. Because we moved in 2003, I have not seen the condition of the fence first-hand but according to my former neighbor it was still in good shape more than ten years later (2010) and in need of minor repairs in 2013. It is highly unlikely that the present owner applied any sealer to the fence since buying the house in 2003.